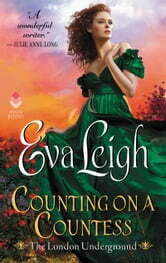 Counting on a Countess by Eva Leigh is book Two in The London Underground series. This is the story of Christopher “Kit” Ellingsworth The Earl of Blakemere and Tamsyn Pearce. I have read the previous book but feel this is easily a standalone book. Tamsyn is in the smuggling business to help her Village and to try to buy the house that her Uncle is wanting to sell. The house is the best location for her smuggling business and doesn't want to loose it. But she hasn't been able to sell her goods to get the money for the down payment for the house. Kit has been on a goal since getting out of the War to enjoy the pleasure of life to try and help him forget the pain. With an ideal to do a pleasure garden to help others he is at a lost of how to get the money when he is giving the chance to marry to inherit the much needed funds. 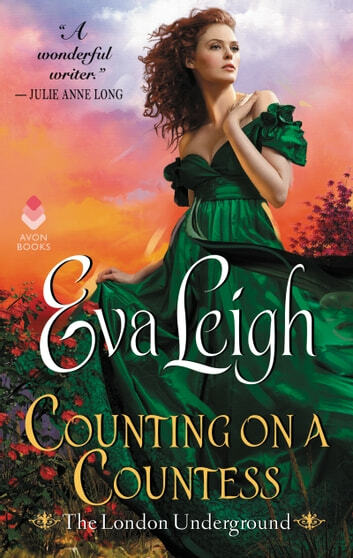 Kit and Tamsyn come together to meet the goal of marrying to get the inheritance but they soon look learn that Tamsyn is the one put in charge of the money..which puts Kt to wooing her to try to get her to fund her dream garden. Tamsyn hasn't told law-biding Kit what she actually does nor that she wants some of that money to help her goal with her smuggling scene. But along the way of them trying to get to their own personal goals they seem to have started to fall in love. Really enjoyed this story!! This is a hard to put down book for sure!